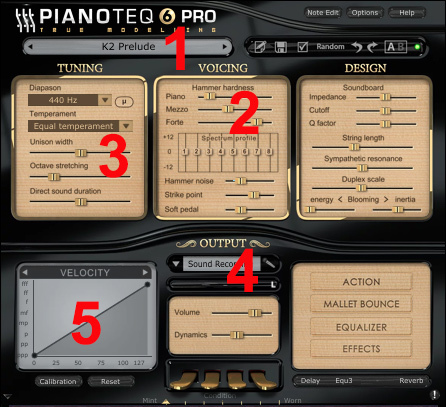 How do I start up Pianoteq? Load the standalone player by clicking on the Pianoteq shortcut on your computer desktop. The VST or Audio Units plugin can be loaded by a VST or Audio Units host. If you have not activated yet, you will see an activation window. Enter the serial number there and click on the "Quick activation" button, if your computer is connected to the internet, to activate your licence (read the Purchase and licence section further below if you need assistance). Which parameter sliders should I adjust to begin with? 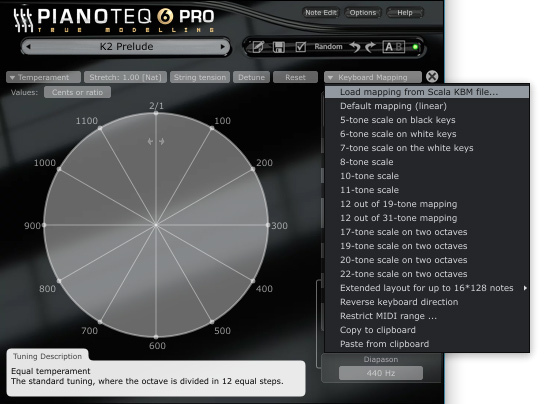 There is a wide range of pre-defined presets (1) that you can choose from. If you need to adapt the piano sound you could for example try adjusting the hammer hardness (2) to achieve a different brightness of the hammer strokes. Increasing unison width (3) makes it a bit out of tune (resembling certain acoustic pianos). The powerful sound recording feature (4) lets you place up to 5 virtual microphones anywhere around the piano to achieve ultimate ambience and tone colour. The dynamics and velocity curve (5) will most likely need to be adjusted to the keyboard used in a MIDI file performance. These adjustments are just examples but might be suitable to begin with. For further details on how to use each parameter, read the documentation in the Help menu or place your mouse cursor on top of each parameter for a short pop-up description. How do I save my own preset? You can save your own preset by clicking on the floppy disk icon (menu: File-Save preset, shortcut: Ctrl+T). Name the preset and save. It will then appear in the preset list under the instrument for which the preset was based on. How do I rename, delete, or assign my own preset I created? You can delete it, rename it and assign it in the preset manager by clicking on the pen icon (menu: Window-Preset manager, shortcut: L). Right click on the specific preset you created. Can I hide specific presets of an instrument? Yes. In the preset manager, you can create your own customized instrument bank. You can save those presets you want to work with there and choose only to show that bank. You can watch a tutorial on how to work with the preset manager here. What is the point of using instrument banks? By using instrument banks, you get a more detailed control of which instruments and presets you want and can quickly change between different sets, adapted to different situations, e.g. one bank for live performances and another bank for studio sessions. 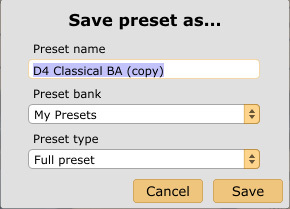 In the preset manager, you can easily move saved presets between banks, assign each to a specific MIDI controller, and rename or delete them. Can I rename or delete a factory preset? No, the basic factory presets provided as default instruments are protected. You can however save presets to a customized instrument bank and there rename or delete them as you want. How can I correct the limited/extreme dynamic output of my keyboard? You can adapt the velocity curve to your MIDI keyboard so that Pianoteq will recognize all velocities from ppp to fff. See the left example below where the curve is adapted to a keyboard having a MIDI velocity output limited to the range [33 105]: the Pianoteq curve remaps this interval to the full MIDI velocity range [0 127]. You can measure MIDI velocity output in Pianoteq by observing the green vertical lines. If you modify the shape of the curve and the dynamics slider, you can obtain different sorts of dynamics. If the keyboard easily jumps to extreme velocity values when playing strongly, there is no ideal correction because Pianoteq cannot see if you are playing forte or fortissimo. However, as it might be better to have a correct forte than a correct fortissimo, we suggest adapting the velocity curve as in the right example. How do I adjust tuning with Scala files? Click on the "mu" button to enter the advanced tuning panel. There, click on the "Keyboard Mapping" button and select "Load mapping from Scala KBM file..."
How do I keep my previous settings (parameters) while changing presets? Click on the checkmark button to access the advanced parameter freeze settings. There you can set which parameters to keep unchanged when you change presets. You can activate and deactivate the freeze feature by clicking on the checkmark button. How do I activate remote selection via MIDI? In the Options-Midi window you have a complete range of MIDI mapping possibilities where you can also create individual settings for each preset. How can I transpose in Pianoteq? In Options-Midi there is a notes transposition value. You can set this value to anything between -36 and +36. How do I create my own MIDI mapping? In Options-Midi, select the "Full featured" MIDI mapping. Make any changes you want and save it. To automatically load this mapping the next time you start Pianoteq, pick the "Set as default" entry. How do I make Pianoteq to always start up in full screen mode?